So we have been on a bit of a kick lately, testing as much TB3 external storage as we could find. And things have come along. Where we were once restricted to external storage of 500MB/s, today’s portable storage is capable of almost 6 times that with Thunderbolt 3. 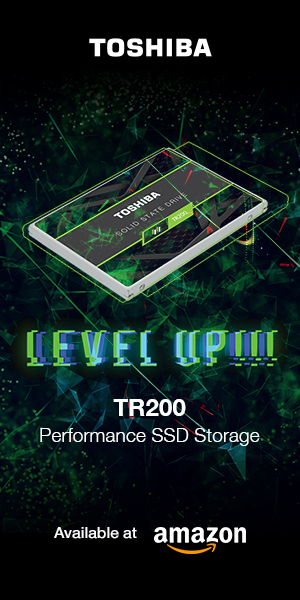 Don’t jump so fast though as TB3 is still rather niche and, in order to get that performance, you still need the right device using the right Type-C cable which is connecting to the right motherboard that is ready willing and able to give TB3 all the speed it needs. Oh… and not to forget that, in order to get those wonderful 40Gbps speeds, the TB3 cable length has to be .5m or less. 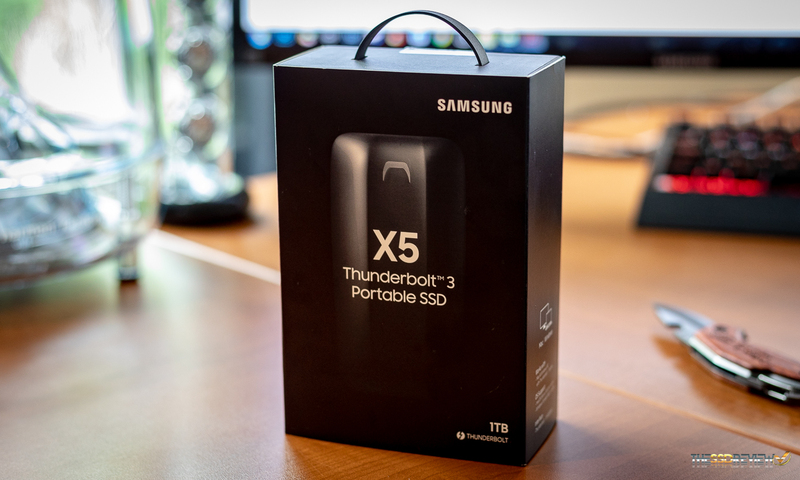 The Samsung X5 Thunderbolt 3 Portable SSD is being sold in Capacities of 500GB, 1TB and 2TB and is capable of performance up to 40Gbps, or 2.8GB/s read and 2.3GB/s write. 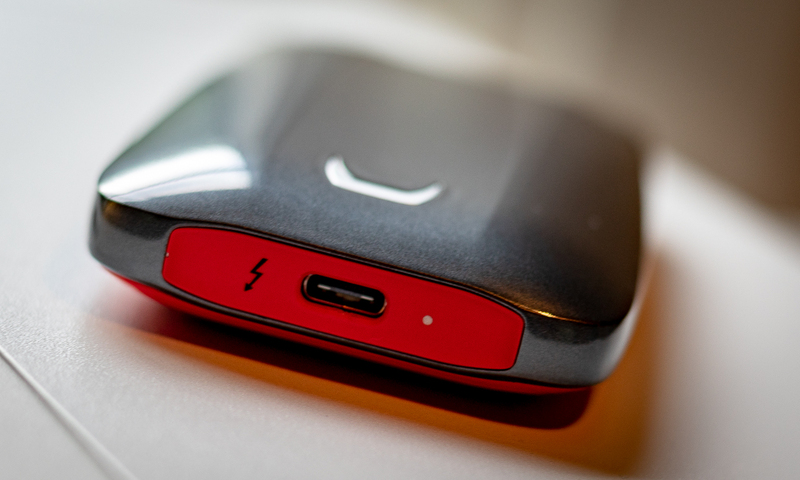 It weighs only 5.3 oz and measures 4.7″ x 2.4″ x .08″ so it is just about as compact as one could imagine. 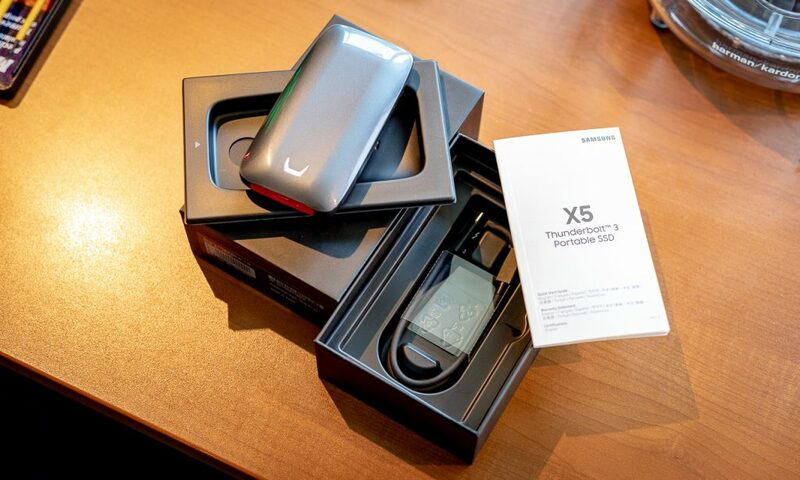 The Samsung X5 comes with encryption software that can be installed which provides password protection and the SSD has AES 256-bit hardware encryption. If you are using the security software and lose your password, you will be investing in a new X5 soon enough. The X5 also comes with a 3-year warranty and will be available globally on 3 Sep 2018 with a MSRP of $399 (500GB), $699 (1TB) and $1399 (2TB). Watch for availability on Amazon. 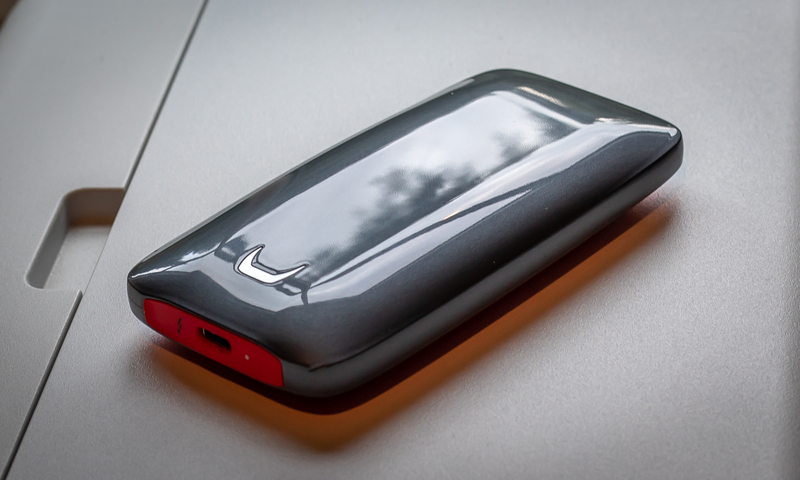 The top of the Samsung X5 has a very attractive glossy grey plastic casing which switches over to a red soft rubber over plastic casing for the bottom. 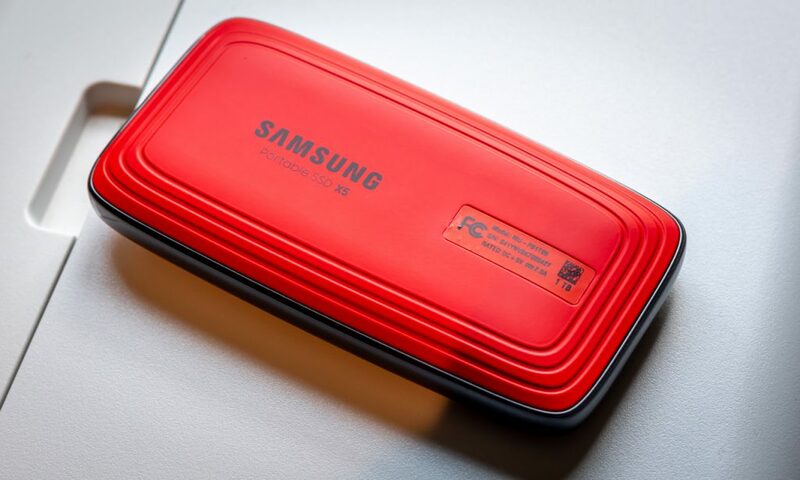 This portable SSD is bus powered so no power cable is necessary; one uses only the data cable for power and data transfer. As well, there is a small dot just to the right of the Type-C port that lights up when disk activity is present. Inside the packaging, we find the X5, a user guide, along with a .5m Type C to Type-C TB3 data cable. 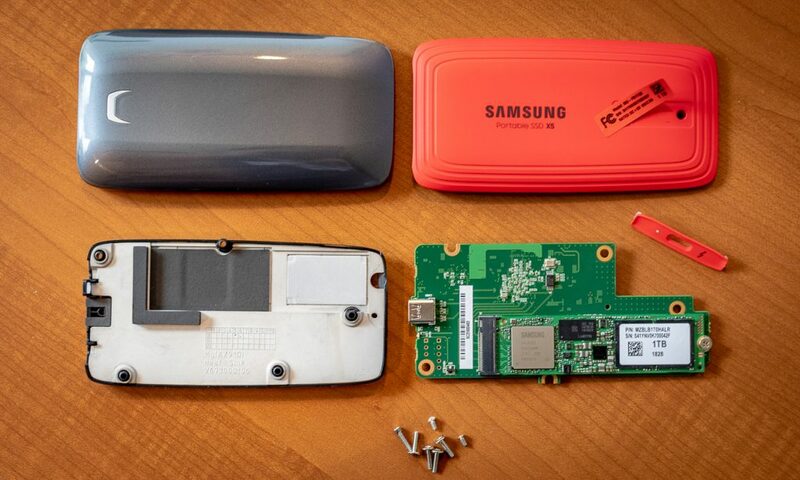 Whats even more encouraging, however, is the fact that this is one of the easiest Samsung storage products that we have ever disassembled. There has been more than one instance of my damaging the casing in trying to get SSDs open throughout the years. Once disassembled, we can identify the parts of the Samsung X5 as being the red base, PCB which holds the Samsung SSD, two pieces of thermal pad for either side of the PCB, a thick white aluminum heatsink, black bracket that places it into the upper grey shell Seven screws are used to secure the SSD, PCB and heatsink, along with the outside case and end piece. 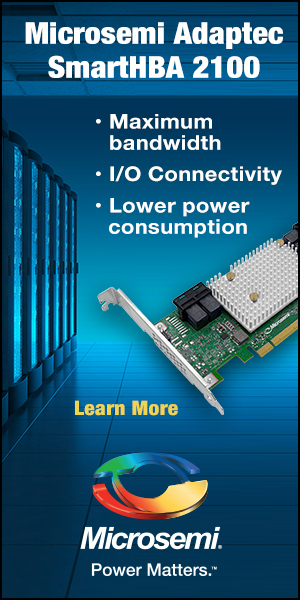 The SSD itself is the Samsung PM981 NVMe PCIe 3.0 X4 M.2 OEM SSD, or 970 EVO equivalent, and contains the newest Samsung Phoenix controller, 3-bit MLC V-NAND with TurboWrite Technology, along with a 1GB Samsung DRAM chip. hi! ¿Can I replace the PM981 NVMe for evo 970 pro in my samsung X5 SSD? I would have the same question; is SSD part in Samsung X5 replacable? why does replacing hard drive cause the malfunctioning of encryptions?